Th-INK-ing of You: Earth's Gladdest Day! Hello friends! I have a real CAS card to share with you! I'm really working on trying to conquer the CAS look... and I think I'm getting more comfortable with it! This card is made with this month's release from ODBD - Earth's Gladdest Day. I stamped the image with Memento and colored with Copics. I hand cut the image and mounted on a Spellbinders Floral Oval frame. I also colored a strip for the horizontal panel. I stamped the sentiment with VersaFine for a heavier ink coverage. I find this sentiment so touching! It just might be one of my favorite Easter sentiments ever! This is one of my favorite color combos too! Well... simple to make, simple to explain! Hope you liked it! Thanks so very much for blessing me with your visit and your comments! They make my day!!! I like the ѵaluable info you рroѵide оn уour aгticles. I will bookmark your ωeblog аnd taκe a loοk аt onсe more right here fгequently. I аm reasonably sure I'll be informed many new stuff proper here! Best of luck for the next! This is a beautiful Easter card! I love the sentiment! God Bless!! This is gorgeous Grace. I love all that white, it always makes a card look so elegant. I just love your card Grace. Your coloring, your colors, as well as your layout with the verse, framing of your image, and the flower panel is gorgeous!! The verse just pops!! What an awesome message!! Gorgeous my friend!! Your Grace, it's spring again, as least I can dream. Your work is always top notch, color, layout, verses, paper, and all the embelishments are just the right touch. Thanks for sharing with us and giving of yourself. What a beautiful Easter card! I am always impressed with your work. Can we "pin" your cards to Pinterest? gurian6... yes you may pin my cards to Pinterest. I do not have the pin it button on my blog, but you can still pin it from a pin it button on your own tool bar. That's how I pin things personally... just added the pin it button from Pinterest to my own tool bar and then I can pin away. Hope that helps! Grace, this is fantastic. Very beautiful. Beautiful, Grace. You always amaze me. Thanks for sharing; especially today. It's been a rough one, and seeing your art and blog posts always lifts my spirits. Thanks so much for sharing! Wow.. This card is so sweet and beautiful.. I love the image and colours. Great to have you joining us at Brown Sugar. I guess it is not unusual at my age to have a fond story for almost anything I see. The sentiment and image touched my heart so much. As always your workmanship is so precise. Another winning beauty. Thank you for joining us at Word Art Wednesday; we love seeing your wonderful art work and we really appreciate you taking time to join our challenge. The Blessing of the LORD be Upon You! Charming, beautiful design and extraordinary coloring. Gorgeous card! Thanks for joining us at Cards By Lady Anne. We look forward to seeing you again. 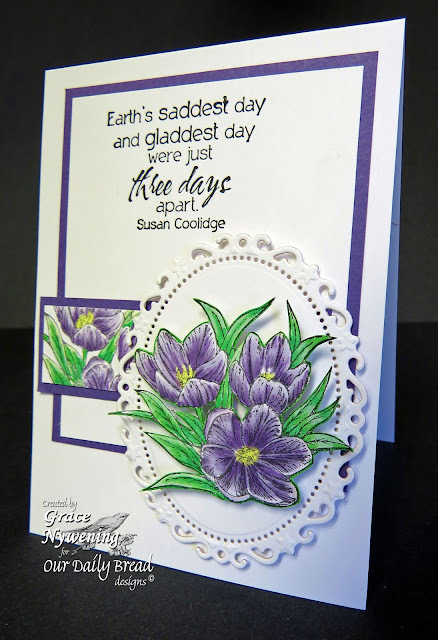 very pretty, love the stamping on the strip too, such lovely coloring! This is such a beautiful card! Love the coloring. Thank you for joining us in the challenge at Brown Sugar Challenge Blog! This is so beautifully designed. Thanks for sharing your talent with us. Good luck. Recipe for a Happy Marriage! North Coast Creations Blog Hop! For the Love of God's Love Blog Hop! Singing Praise with pink chalk! May Birthday Blessings Fill You with Joy!